The check-out process is fast and easy. If you have a check-out icon, click it. Otherwise go to Front Desk > Front Desk Operations > Check out. At the prompt enter the guest's room number. If you do not know the room number you can look up the guest by name. 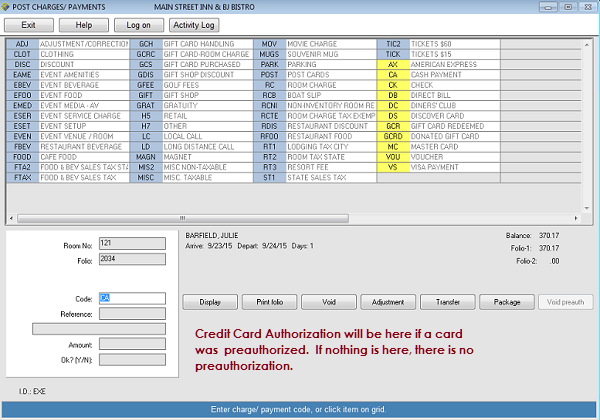 If there is a balance on the folio, the Post Payment screen will open. To pay with the payment type entered at check-in, just press Enter through each field. When the folio balance is zero the check-out will finish. A popup will allow you to print or email the folio. Enter the room number in the Room field. Press Enter or Click OK. Press Tab to get to the Name field. Enter part of the guest's last name. Press Enter. Use your keyboard down-arrow to select the guest and then press Enter. 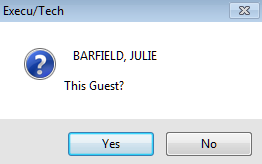 Alternatively, click the guest's name. A popup will verify the guest selected. Press Enter if it is the correct guest. If there is a split folio for this guest, a popup will allow you to select the folio. A split folio means that there is a primary folio for room & tax charges and a secondary folio for incidental charges. Continue to press Enter. The amount due displays. To pay the amount shown, press Enter. Otherwise enter the amount to pay by this payment type. If you post a cash payment (Code CA or CA*) a popup will ask for amount tendered. This is the amount the guest hands you, not the amount due. Enter the amount and press Enter. If the guest gives you the exact amount, just press Enter. A popup will show the change due the customer. Press Enter after giving the guest the change. When the folio balance is zero, the check-out will continue. A final popup will ask if you want to post any more charges or payments. Press Enter if no. If you have additional charges or payments to post, answer Yes. After you post the additional charges and payments, this popup will display again. When you answer No, the check-out will complete. You will have an opportunity to print or email the guest's folio. There must be an email in the guest's folio for the email to go out. 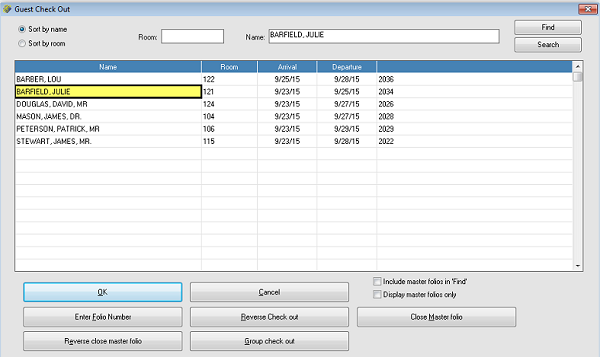 You can print more than one folio by selecting the number in the "Copies" field. NOTE: If this guest has a split folio because a wholesaler is paying the room and tax, then present only the secondary folio to the guest. The guest will not see the primary folio. If you are unsure, ask your manager. Depending on your settings, the system may ask if you wish to make another reservation for this guest now. This is handy for frequent returning guests. 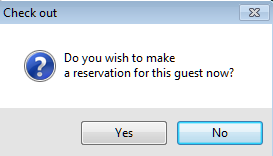 If you answer Yes, the reservation window will open allowing you to make the reservation. Press Enter if you do not wish to make a reservation for this guest now. This popup can be turned off. To close a master folio select "Close Master folio". You can click this button or press Tab until it highlights. You will need the folio number. If you do not know it, click "Include master folios in find" and optionally "Display master folios only" and then search for the folio name as you would search for a guest name. If you need to post additional charges or payments after check-out, select "Reverse Check out". You can click this button or press Tab until it highlights. You will need the room number. Remember to end up with a zero balance and then check the guest back out. You also can select "Reverse close master folio". You will need the folio number. You can do a reverse check-out only on the day of check-out. After night audit Reorganize Files has run, you cannot reverse check-out a folio as it will now be in history. You can check out a group by selecting "Group Check out". You will need the group code. You can click this button or press Tab until it highlights.